Successful consulting project with Calgary Stampede results in increased scope of work - The Aspire Group, Inc.
ATLANTA, GA – Calgary Stampede, The Greatest Outdoor Show on Earth, has expanded its scope of work with The Aspire Sport Marketing Group for a remote sales and email marketing campaign for the 2018 event. Aspire will dedicate two sales consultants in the National Sales Center (NSC) to assist Calgary in boosting ticket sales and service efforts as well as provide intelligent e-marketing to optimize efficiency, engagement, and reach. The agreement follows up a consulting project Aspire’s Strategic Consulting & Research (SC&R) team conducted for the Calgary Stampede to identify additional opportunities to drive revenue and increase ticket sales for the annual rodeo and evening show. The 2017 event was one of the best in history drawing over 1.2 million guests over ten glorious days in July. Aspire has worked with over 58 partners, including multiple entertainment events, with remote sales support generating over $8.2 million in revenue. The NSC is currently selling for the NFL Pro Bowl, Honda Battle of the Bands, the University of Richmond and the Ivy League Men’s & Women’s Basketball Tournaments. The campaign is set to launch February 2018. The Calgary Stampede celebrates the people, the animals, the land, the traditions and the values that make up the unique spirit of the west. 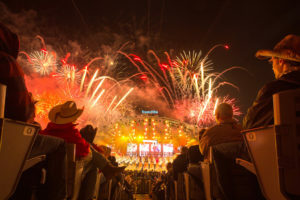 The Calgary Stampede contributes to the quality of life in Calgary and southern Alberta through our world-renowned Stampede, year-round facilities, western events and several youth and agriculture programs. Exemplifying the theme, We’re Greatest Together, we are a volunteer-supported, not-for-profit community organization that preserves and celebrates our western heritage, cultures and community spirit. All revenue is reinvested into Calgary Stampede programs and facilities. For more information, visit www.calgarystampede.com. The Aspire Group is a global sports and entertainment marketing firm specializing in driving revenues, attendance and fan engagement through industry-leading ticket marketing, sales & customer service. Aspire created the outsourced ticketing niche, revolutionizing Intercollegiate Athletics with the first Fan Relationship Management Center (FRMC) at Georgia Tech in 2009. Over 200 collegiate and professional properties have trusted Aspire to drive revenue, attendance and enterprise value growth through the combination of strategic consulting and research services, data insights and best-in-industry fan relationship management.